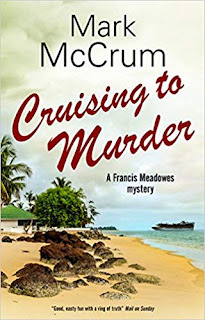 Francis Meadowes is a crime writer and has been invited to give a lecture on the cruise ship the Golden Adventurer in return for a free cruise. This is the high end of cruising, mainly wealthy Americans, some British and a German. Most cruise ships have between 800 and 1200 passengers on board, but this one has considerably less. Sailing the west coast of Africa, the itinerary is not the usual tourist visits but unusual and rare sights. Francis is befriended by German retired surgeon, Klaus, an elderly lady who is a widow and has sailed on many cruises and looking forward to more, Eve, and an American single lady, Sadie, travelling with her aunt. When Eve is found dead in her bed and the ship's doctor is reluctant to sign the death certificate everyone is naturally alarmed. When there is then a “man overboard” situation and they realise it is a young woman who is travelling with an older man, everyone is then convinced there is a murderer on board, despite the captain suggesting it is suicide. Francis is asked by the captain to investigate because of his previous success at a literary festival murder. One of the excursion staff accompanies Francis in his investigations on behalf of the captain. Francis gets deeper into the mystery and soon realises his own life is at risk. Can he solve the case before it is too late? The author knows his cruising. I've only been on the larger ships, but the description of the activities and the life on board is similar. He has written mainly non-fiction books except THE FESTIVAL MURDERS which also featured Francis. This was very enjoyable and I highly recommend it. I look forward to reading more about Francis, starting with his previous book.